Welcome to ALANDIA, the online store where to buy original Absinthe in the US. Original means that ALANDIA sells real European Absinthe made with wormwood and based on traditional recipes from the 19th century. Buy the real thing, buy your Absinthe at ALANDIA. >> We ship to the USA via Airmail and Courier Express. Your order will arrive at your door within 8-10 days (Airmail) or 2-3 days (Courier Express), whatever you prefer. All orders include our 100% ALANDIA Delivery Guarantee, meaning that you will get your order safe and sound or we will refund your your money. There is absolute nothing you have to worry about. >> We accept Paypal and all major credit cards. Ordering your bottle of Absinthe is therefore safe and convenient. If you directly want to start browsing through our extensive line of real Absinthe for sale including our premium selection of Absinthe accessories, just click on one of the recommended products below. Absinthe, is it legal to buy? There are often common misunderstandings about the liquor Absinthe. People sometimes think that the green spirit known as the Green Fairy is still forbidden and poisonous. This is not true, buying a bottle of Absinthe is legal, also in the USA. There it was legalized in 2008. In Europe, the European Union already legalized it in 1998. Why did they legalize the Green Fairy? The answer is Absinthe is not poisonous. If you drink a glass of Absinthe, there is nothing you have to worry about. Absinthe is not a hallucinogenic drug, although real Absinthe contains wormwood. But the concentration of thujone / wormwood in an Absinthe is very low (35 mg/l thujone are legal in Europe, 10 mg/l thujone are legal in the USA). Therefore you will not have any negative side effects (including hallucinations). It is important to mention, that the amount of thujone in real Absinthe was neither higher in the 19th century. This is a common myth. Vintage Absinthes were analysed and guess what, the levels were sometimes even lower than today. What primarily causes an Absinthe effect is the high alcohol percentage of 68% ABV / 136 proof. Vodka and Whiskey have for example an alcohol percentage of 40% ABV / 80 proof. Therefore Absinthe is in comparison very strong. But again, do not expect to see pink elephants, Absinthe will not give you hallucinations. Absynthe (alternative spelling) is a spirit with a rich history. During the 19th century it was the drink of choice in Europe, especially in France. You can state, that Europe and Absinthe build a relationship like Italy and pasta. The Absinthe culture simply originates in Europe. Here the green liquor was invented in 1789 and many Absinthe distilleries that produced the spirit for the worldwide demand were located there. Most of the Absinthe brands we offer for sale are from distilleries, that already produced the green liquor 100 years ago. Our ALANDIA Spirits house brands Strong68, Maison ALANDIA, ALANDIA Verte, Heritage Verte, République and Moulin Vert are such examples. They are made in France at a family-owned distillery, that was established in 1859. The wormwood used for Absinthe distillation is cultivated on the fields of the distillery, like it was done a century ago. This guarantees best quality and maximum authenticity. You will find more information about these original Absinthes at the product description pages. Where can I buy Absinthe online, and which brand is the best? You can purchase a lot of different Absinthe brands at different price levels at the ALANDIA Absinthe store. If you want to buy strong Absinthe at a reasonable price you should order Strong68. It is distilled with a higher amount of wormwood. If you are looking for highest quality at a slightly higher price, then you should order an Absinthe from our Original Absinthe section. An outstanding Absinthe for sale is for example Maison ALANDIA. It is made with 16 different herbs and has therefore a very complex taste. We also offer the Jade Absinthe line for sale, including Jade Terminus Oxygenée, Nouvelle Orleans, Verte Suisse, PF 1901 and Edouard. These Absinthes are distilled in France by the Combier distillery, supervised by the US chemist and master distiller Mr. Ted Breaux. These brands are true recreations of famous vintage Absinthe brands. They belong to one of the best available brands on the market. Where to buy Absinthe in the US? Absinthe was commonly consumed in the United States of America in the French Quarter in New Orleans. A famous Absinthe bar, "The Old Absinthe House" still exists and you can order a glass of Absinthe there. Famous personalities like the poet and writer Ernest Hemingway consumed their glass of Absinthe in this famous bar. The most famous American Absinthe brand in the US was Herbsaint. It is still for sale in the US but as a thujone-free Pastis. At some liquor stores you can also find American Absinthe for sale. But only Absinthe brands made according to US standards. This does not mean that these bottles are not real or of bad quality, it simply means, that these American brands are made with a lower amount of wormwood, not exceeding the American legal level of 10 mg thujone. If you are more interested in where to buy original Absinthe from Europe the easiest is to order it online at our Absinthe online Store. Which US Absinthe is the best to buy? There are a bunch of Absinthes for sale on the US market. One of the first brands you could buy in liquor stores after Absinthe was legalized in America in 2008 / 2009 was St. George and Tourment Vert. St. George can be considered as a decent Absinthe as it is not artifcially colored like Tourment Vert. Nevertheless the recipe of St. George is quite fancy, meaning that herbs are distilled, that are not 100% authentic. They use for example basil, which was not used back in the 19th century. Additionally, they skip green anise and use star anise instead. Nevertheless this brand is ok, if you want to get started and want to purchase your first bottle. Other brands are Leopold, Pacifique and Kubler. These ones are ok as well. Lucid Absinthe was also one of the first US approved products. It is distilled in France by Mr. Ted Breaux. Nevertheless it is a bit "watered down", not so powerful as other premium Absinthes. Another brand, that is available for sale in the USA is Mansinthe. It is the official Absinthe of the musician Marilyn Manson. Despite Manson's extraordinary personality his Absinthe is quite traditional. Mansinthe is made in Switzerland using a traditional recipe and its color is naturally green. Nevertheless the Absinthe has devilish 66.6% alcohol by volume. It is a good Absinthe to begin with, as it does not have a too intense taste. Below you can see a video of the traditional French Absinthe ritual. It is the preparation method that we recommend and how you should drink Absinthe. As you can see this ritual does not include fire. You only use ice-cold water and sugar. 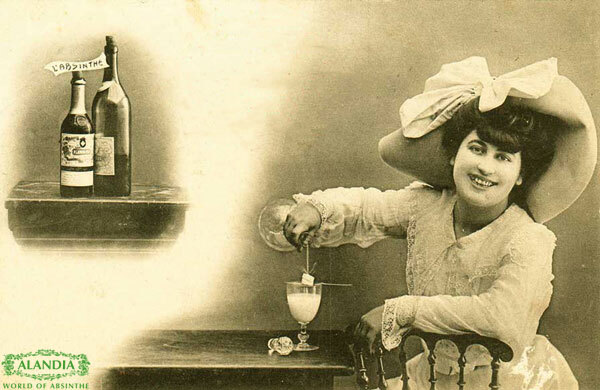 This is the original way how Absinthe was as well prepared back in the 19th century. You can see this preparation method in our video below. The fire ritual is a modern invention that we actually do not recommend. It is dangerous to set your Absinthe on fire and the fire destroys the fine flavors of any Absinthe. It is like mixing a good red wine with Coke, you simply should not do it. Additionally the Absinthe glass can crack, especially if the Absinthe inside the glass catches fire.